There is nothing like breathing underwater for the very first time. It takes a little getting used to –after all, human beings weren’t designed to do that – but after a few minutes of awesome wonder, most participants realize how easy scuba diving really is. The biggest challenge instructors have with the Discover Scuba Diving program is not getting participants into the water, but getting them out when the program is over. The fun part? It’s all fun! Theory: With the help of a flip chart or a video, we will explain to you a certain amount of theory and we will make sure that you understand the important rules of diving. The lesson will be short and concise, designed to inform you but not to confuse you. Pool: Your professional instructor will demonstrate the basic skills required to dive. Once you have had a chance to see how it all works in the water, it will be your turn to give it a go. Under the ever watchful eye of your instructor you will see your diving skill level develop in this safe learning environment. The pool session will prepare you for the exciting dives. 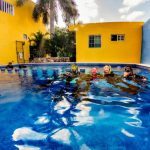 Ocean Dives: When you are comfortable with the skills, you will dive among marine life in amazing shallow reefs off the coast of Playa Del Carmen. Your air gauge will be carefully monitored, to ensure that you don’t get low on air. The dive will last about 45 minutes, depending on your comfort level. You will be surprised by how quickly you will relax! In the morning, you will have some theory and pool training. After a lunch break, you will do the dives in the clear water of the Caribbean Sea. All the equipment you will need is typically included in a Discover Scuba Diving experience. You’ll use all the basic scuba gear including a mask , snorkel and fins, a buoyancy compensating jacket (BCD) that also carries your scuba tank, a scuba regulator to breathe from and instrumentation to monitor depth and air supply, a scuba wetsuit and a weight system. Towels, swimsuit, and extra cash for lunch.